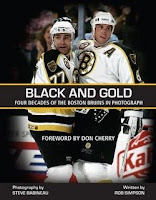 ► Black And Gold - a stunning collection of photographs of Steve Babineau, the Boston Bruins official team photographer since 1973. With writer Rob Simpson, Babineau shares his 40 years of memories with one of hockey's most storied teams. ► Canada On Ice - Author Dave Holland covers every World Championship tournament from 1920 through 2008, offering a unique Team Canada perspective. ► Montreal: 100 Years Of Glory - Scouring through endless newspaper archives author D'Arcy Jenish accessed the long forgotten work of the sports journalists who reported the moment history actually happened. Therefore his book captures the spirit of history as it unfolded. This is the true history of the Montreal Canadiens, warts and all. ► Night Work: The Sawchuk Poems - Through a collection of 70 poems, author Randall Maggs uniquely re-imagines the life of Terry Sawchuk. ► NHL Guide & Record Book - The National Hockey League's annual statistical compendium. ► Patrick Roy - This is Patrick Roy's initially reluctantly authorized biography. He turned down requests from several writers and allowed his own father to tell the story of hockey's greatest goalie. Michel Roy also tries to set the record straight on a few issues. ► Reflections 2008 - The NHL's annual coffee table book of amazing photography. Some of the proceeds of sales of this book goes to Hockey Fights Cancer. A great book and a great charitable cause. ► Road To Hockeytown - One of the league's great executives, Jimmy Devellano writes his autobiography, sharing his many memories and stories from his 40 years in the National Hockey League. 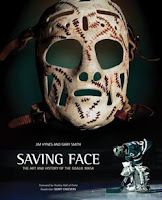 ► Saving Face - Authors Jim Hynes and Gary Smith look back the history and the art of the ever popular goalie mask. ► 100 Great Canadian Sports Moments - James Bisson organized a panel to rank the greatest moments in all of Canadian sports history. Lots of hockey ensues. ► Hockey Player For Life - Howard Shapiro's heartwarming story of the can't miss kid who missed, but learned a lot along the way. Foreword by Keith Primeau. 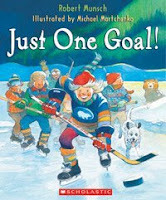 ► Just One Goal - Robert Munsch, perhaps the greatest children's author of our time, writes a hockey book! ► Wendel & The Great One - Mike Leonetti teaches leadership and sportsmanship through the starry eyes of kid who idolizes Wendel Clark and Wayne Gretzky.